Study for an ITIL Service Strategy (SS) qualification today with a fully accredited online training course from 4PA e-Learning! ITIL Service Strategy (SS) is an intermediate level qualification and is one of five ITIL Service Lifecycle modules covering management and the control of activities and techniques documented in the ITIL Service Strategy publication. On completion, qualified ITIL SS individuals will be able to demonstrate an understanding of the risks and success factors to develop and progress strategy within an organization or programme. The objectives of this ITIL Intermediate Service Strategy course are to fully understand the customer business objectives and priorities and the role that IT services play in enabling these objectives to be met. Key topics that are covered in the course include; service value definition, business-case development, service assets, market analysis, and service provider types. Why Study ITIL SS with 4PA ? This e-learning course contains all the learning materials you need in order to prepare for the ITIL Service Strategy exam. Our course has been accredited by PeopleCert, who are licensed by AXELOS as an Examination Institute for the ITIL® Service Strategy Certificate in IT Service Management. This course provides holders of an ITIL® Foundation certificate with a practical level of proficiency in the management of the Service Strategy stage of the Service Lifecycle. Thinking of sitting the ITIL Service Strategy Exam? On this page, you will find everything you need to know! 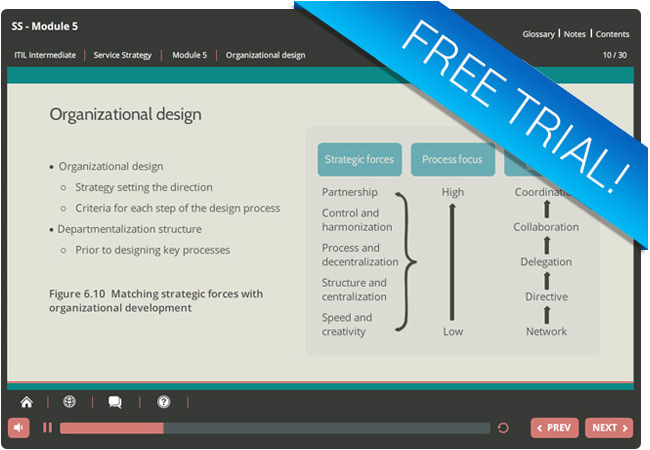 The course materials provided in the Service Strategy e-learning course will provide you with all the information you need for this exam. Why not try out a free trial module from our ITIL Service Strategy eLearning course! In this ITIL Intermediate trial module, you will learn the about Strategic Planning and Control Processes, Service Management driven by Strategy, and the critical role of Service Interfaces. Like the full ITIL Service Strategy (SS) eLearning course, you can access this free trial module from any device whether you are at home, at work, or on the move!